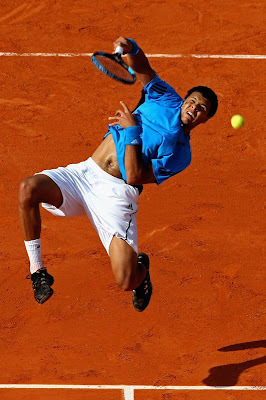 Tsonga won the battle of France against Benneteau and looks actually good on clay. He probably is the best chance of the French trio (no Musketeer jokes please) since Simon’s out of form and Monfils won’t last a week with his injury. Ferrero beat Ljubicic in five, Monaco beat Baghdatis, Wozniacki overcame the surprising Dushevina, Serena struggled but beat Zakopalova in three, Wickmayer beat U Radwanska, Dokic beat Sprem – is it bandwagon time yet? and Ruano Pascual ended Vaidisova’s expectations as expected. Dani’s gone to join Chaky and Nicole at the hall of wasted potential and James Blake won a match on clay. Only one press question for poor Svetlana after her match. Rafa’s blogging on Harry Potter and Fed’s baby. French Open Diary (Abigail Lorge). Venus vs Safarova – can Venus stuff this up? Petrova vs Sharapova – don’t you hate being seeded and drawing a dangerous floater? Santoro vs C Rochus – fourth set 5-3 Rochus - Can the wizard come back? Murray vs Starace – now Murray is going to lose one of these, but will it be this one? Kiefer vs Ferrer – possible upset? Video: Alize Cornet to run naked around the court if she wins the title? Simona Halep will have breast reduction surgery.